Great News! Today, you can get entered to win this!! 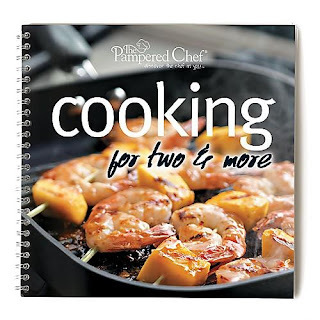 Shari Trujillo of Pampered Chef has generously offered this "Cooking for two & more" to one lucky follower of Love, Actually!! This cookbook contains more than 60 fresh, simple and innovative recipes tailored to lifestyles of smaller households. Chapters like “Weekend Chef” offer contemporary-American, restaurant-style cuisine. “Trip for Two” includes a variety of popular ethnic cuisines. “Cooking With Friends” helps you create appetizers and desserts for 4-8 guests. I'm thinking you may find a great new recipe for your homecooked Valentine's Day dinner in this book! Be sure to leave your email address if your profile does not contain your contact information. Giveaway ends Sunday, January 24th! Thanks again to Shari for sponsoring this fun giveaway! I'm already a follower, and I attempted to vote for you...although I seem to be mommyblog challenged, so I may not have actually! I'll put this in my giveaway sidebar on my blog as well! I am a follower. I love your ideas! I love this blog - I'm a follower! I am a follower and of course I'll vote for you! I'm a follower and voted. I emailed her to sign up for her newsletter. I follow Love Actually on facebook. Dezi Allen. I'm a follower, and voted for you 'cause you rock! I'm a facebook follower, can't wait to see you there! I'm a twitter follower too. I am a follower and I voted for you! I just posted on my blog about your awesome blog. Thanks for your great ideas! Your button is on my blog! You have such an inspirational site! I've just become a follower and look forward to regular updates from now on! I recently started following your blog. And thank you for sharing ways to be creative about "love" in our lives. Love reading your blog, love cooking and LOVE pampered chef!! I just started following your blog, and I love your romantic ideas! I'm hoping I can use some of them to improve my relationship with my hunny! I voted for you too! This cookbook is awesome! It's just me and my man, and sometimes cooking can be a challenge without creating an extra week's worth of left-overs that we just throw away. Now I'm a FB fan as well! Exciting! And I'm following you on Twitter! and a fan on facebook! i'm a follower and i am doinf the date of the month club.. already did Jan- mocktailes at the club or the living room whatever. we had fun. thanks for your ideas. I'm a follower and voted - also gave date of the month club - great idea! I am a follower on Facebook!! Following you on Twitter as well!! I signed up for Shari's email newsletter (love pampered chef)!! Ok, so I think I voted for Love Actually at Top Mommy Blogs but am not 100% sure. I clicked on the link so hopefully my vote is in! I'm a follower; I've got your button; I'm now a facebook fan, and I really love to cook! Oh and I'm going to vote on Mom Blogs right now! I voted! Thanks for the chance! I became a fan on facebook and voted on mom blogs! That book looks awesome! I'm a follower and voted. Thanks for the chance to win this awesome book! Great giveaway! I love cooking :) I am already a follower and voted! I am a follower and voted. LOVE THIS BLOG!! Love pampered Chef! I am a follower! I am a facebook fan!!! How fun! I am following you on twitter!! I have signed up for Shari's Newsletter! Of course I follow your awesome blog. We just did the library date and I can't wait to do more. Became a fan on FB and will get the others done soon. What a wonderful giveaway! Wow, I am really very happy to see all new makings from you. Being so much thankful to you for all new makings and it will be the special dish from your book. I have subscribed for it. I put your button on my blog! I voted for you at topmomblogs!